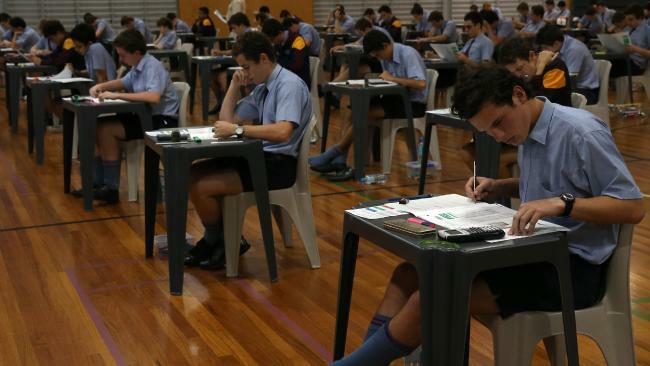 Students sit the Queensland Core Skills Test whose results was released early in a huge bungle by the QCAA. STRESSED-OUT Queensland students and their parents are reeling after an online glitch saw thousands of potentially false Year 12 results released online weeks before they were supposed to be published. Students began discovering apparent results for the state's Core Skills Test had been published on the Queensland Curriculum and Assessment Authority (QCAA) website early on Saturday morning. 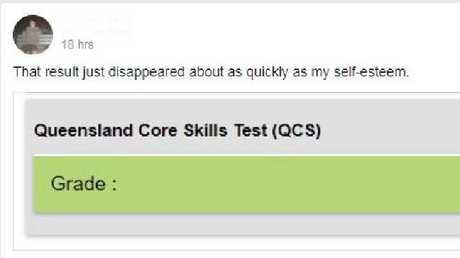 The Queensland Core Skills Test, known as QCS, is used to scale students' Overall Position (OP) scores which determine university entry. 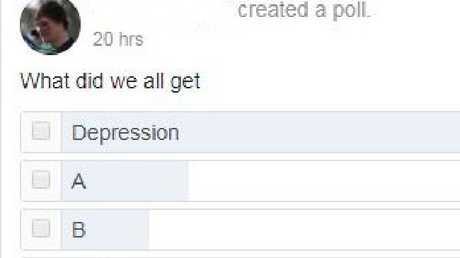 The results weren't due to be released to the class of 2017 for almost two weeks. But keen graduating students logged on yesterday to discover an A to E grade for the statewide test, and word quickly spread. On social media, students alerted others that grades were available, and those who could see their results didn't delay in celebrating or expressing disappointment. Students started to question whether the published results were real and raised the issue with QCAA. 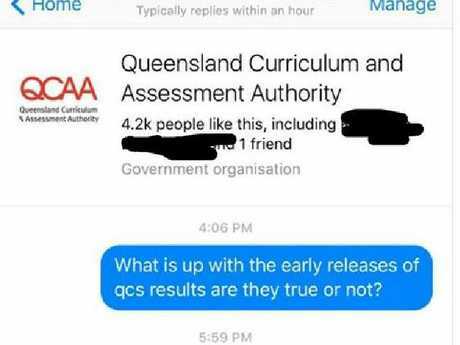 Facebook messages shared online between students and the QCAA page show a standard response warning the results were "preliminary" only. Students react after 'preliminary' QCS Test results were released online almost two weeks ahead of schedule. 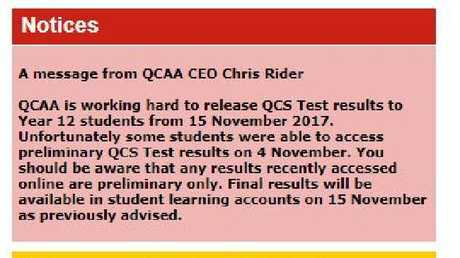 "The QCAA is working towards releasing QCS Test results to Year 12 students from 15 November," students were told. "Unfortunately some students were able to view preliminary grades earlier today. We apologise for this error." Published grades were taken offline later on Saturday. In a statement sent to news.com.au, QCAA CEO Chris Rider said the bungle was caused by an "administrative error". "Preliminary QCS Test results were accidentally released yesterday as a result of an administrative error," he said. Mr Rider advised students "disregard the grades their viewed" and wait for official grades to be released on November 15. "We apologise to students and their families for any confusion caused," he said. The shock came as the bulk of stressed-out students were still studying for final Year 12 exams to be sat over the next two weeks. 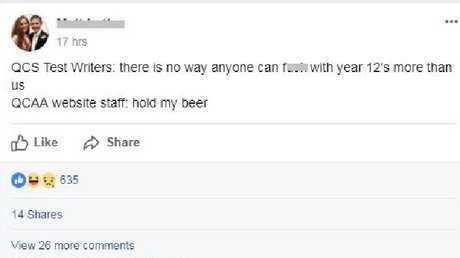 Parents of Year 12 students also took to social media either celebrating their kids' results, or lamenting the glitch. "QCS results out early ... Lauren go an 'A'," one mum wrote. "This will be a boost for her goals to score a high level OP score for Uni entrance. Very proud." A statement from QCAA CEO Chris Rider published on the QCAA website.